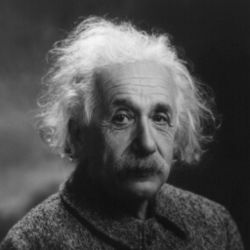 This text of Albert Einstein's copyrighted essay, "The World As I See It," is a shortened version of the original essay. The essay was originally published in "Forum and Century," vol. 84, pp. 193-194, the thirteenth in the Forum series, Living Philosophies. It is also included in Living Philosophies (pp. 3-7) New York: Simon Schuster, 1931. For a more recent source, you can also find a copy of it in A. Einstein, Ideas and Opinions, based on Mein Weltbild, edited by Carl Seelig, New York: Bonzana Books, 1954 (pp. 8-11). "I have never looked upon ease and happiness as ends in themselves -- this critical basis I call the ideal of a pigsty. The ideals that have lighted my way, and time after time have given me new courage to face life cheerfully, have been Kindness, Beauty, and Truth. Without the sense of kinship with men of like mind, without the occupation with the objective world, the eternally unattainable in the field of art and scientific endeavours, life would have seemed empty to me. The trite objects of human efforts -- possessions, outward success, luxury -- have always seemed to me contemptible. "My passionate sense of social justice and social responsibility has always contrasted oddly with my pronounced lack of need for direct contact with other human beings and human communities. I am truly a 'lone traveller' and have never belonged to my country, my home, my friends, or even my immediate family, with my whole heart; in the face of all these ties, I have never lost a sense of distance and a need for solitude..."
"My political ideal is democracy. Let every man be respected as an individual and no man idolized. It is an irony of fate that I myself have been the recipient of excessive admiration and reverence from my fellow-beings, through no fault, and no merit, of my own. The cause of this may well be the desire, unattainable for many, to understand the few ideas to which I have with my feeble powers attained through ceaseless struggle. I am quite aware that for any organization to reach its goals, one man must do the thinking and directing and generally bear the responsibility. But the led must not be coerced, they must be able to choose their leader. In my opinion, an autocratic system of coercion soon degenerates; force attracts men of low morality... The really valuable thing in the pageant of human life seems to me not the political state, but the creative, sentient individual, the personality; it alone creates the noble and the sublime, while the herd as such remains dull in thought and dull in feeling. "This topic brings me to that worst outcrop of herd life, the military system, which I abhor... This plague-spot of civilization ought to be abolished with all possible speed. Heroism on command, senseless violence, and all the loathsome nonsense that goes by the name of patriotism -- how passionately I hate them! "The most beautiful experience we can have is the mysterious. It is the fundamental emotion that stands at the cradle of true art and true science. Whoever does not know it and can no longer wonder, no longer marvel, is as good as dead, and his eyes are dimmed. It was the experience of mystery -- even if mixed with fear -- that engendered religion. A knowledge of the existence of something we cannot penetrate, our perceptions of the profoundest reason and the most radiant beauty, which only in their most primitive forms are accessible to our minds: it is this knowledge and this emotion that constitute true religiosity. In this sense, and only this sense, I am a deeply religious man... I am satisfied with the mystery of life's eternity and with a knowledge, a sense, of the marvellous structure of existence -- as well as the humble attempt to understand even a tiny portion of the Reason that manifests itself in nature." Profound is the only word in my vocabulary which can adequately describe what I think of this 'shortened' essay by Einstein. He is one of the most celebrated scientists of last century and thought by some to be eccentric. If this 'shortened' essay is any indication of his eccentricity, I want to be labelled an eccentric too. Note: My consideration here is this shortened form of his original essay. These comments are not to be taken as comments on his unabridged essay by the very same title. Yeah ,,, but I'll note that when push came to shove, he signed that famous letter that helped get the atomic bomb developed. He also drove a truck in the auxiliary part of the Swiss military, not being of good enough health to be a regular (all reserves, actually, the Swiss standing army is very small). For someone who lived in the worst parts of the 20th century, who would have ended up as a lampshade if not for the military virtues he loathes so much without understanding them in the least ... well, I won't judge such a mind too harshly, but I can't give him very much respect outside of his demonstrated areas of serious competence. He's just one in a long list of scientists of that period who are totally lost outside their field. I am not even considering his achievements or anything else. My sole judging criteria in this blog post was the excerpt of text posted in the article. I have serious doubts that atomic bombs even exist. Just my two cents. @ Harold "yeah ,,, but" here's a predicament: You've been forced out of your home, maybe even country, and live in constant fear of being detained indefinitely. The powers fighting for your freedom are few and far, and you and a few others know what is to be produced by the nazi party in terms of devastating power. How stupid would you have to be to NOT want to tell the world (or at least the powers who are fighting for you) of their plans? Just because you're a pacifist doesn't mean you won't try to defend yourself, being apposed to violence is not apposing your right to fight for your life. I make my statements assuming you're speaking of the Einstein–Szilárd letter. He drove a truck? You're mad he drove a truck? or was your point that he was in the swiss military? The obligation to enlist in the military? I don't believe he served in any capacity for the auxiliary military service he was in. Your last comment seems ill thought out. You seem to not understand that the hatred is directed primarily at NAZI Germany and the thoughtless military actions that were carried out. If a military-state has the power to gather up and begin seizing property and committing atrocities, it's gone way too far and something needs to be said. Are you telling me that someone shouldn't feel too harshly about the power of the military when they've been living in fear from it? It seems it is YOU who does not understand. You wouldn't 'judge such a mind too harshly'? Are you doing someone a favor? Why do you have to judge at all? He may have been pretty lost outside the order and disorder that could be predicted by mathematics and science,but because society is incredibly unpredictable & seemingly unintelligent. Most 'normal' people don't think too much, or too hard about a particular subject or idea. Most 'normal' people don't read too much, or study too much on a subject or idea, they care too much about the wrong things and the common consensus often rules as truth.